This was the scenario facing Quinnipiac catcher Colton Bender as he stepped to the plate. Bender, needing a hit to keep his team’s hope of avoiding a sweep alive, had the chance to send Quinnipiac fans home happy. Bender had fouled off four straight pitches and worked his way to a full count when Canisius pitcher David Yankowski decided to go back inside. 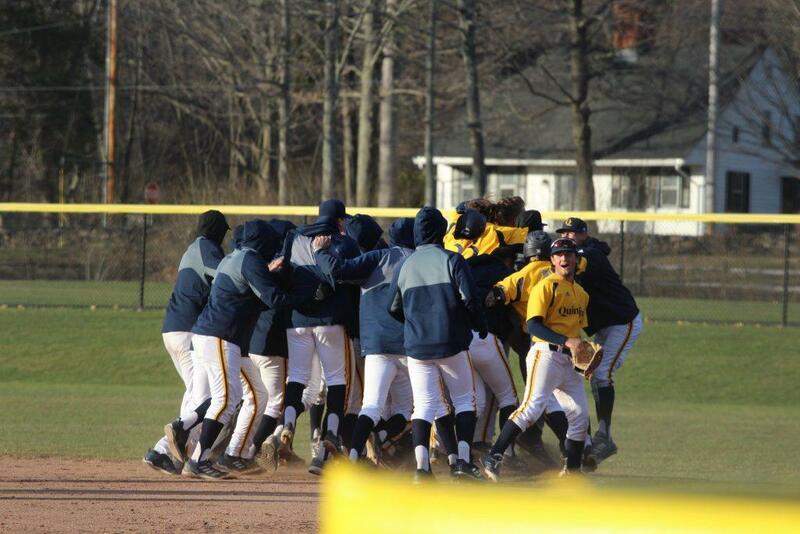 Bender capitalized, driving the ball down the left field line past two Canisius defenders, bringing teammate Kevin Huscher all the way around from first to score the game winning run. Bobcats, 10. Golden Griffins, 9. Ballgame. After two disappointing losses on Saturday to Canisius, Quinnipiac showed its resiliency and determination on Sunday and fought its way back to a tie for first place in the MAAC. Quinnipiac had a 2-0 lead in the second inning and a 5-3 lead in the third, but both were erased by Canisius three-run home runs, courtesy of William Krull and Jacob Victor. Quinnipiac’s bullpen stopped the bleeding, and its offense clawed back to a make it a 9-7 game going into the bottom of the ninth inning. That’s when Evan Vulgamore launched a solo home run to left center, giving the Bobcats life. Even with some timely hitting, it appeared as though the Bobcats’ efforts were going to fall short when Dylan Lutz hit a ground ball to Stephen Bennett with two outs in the ninth. Fortunately for the Bobcats, Bennett misplayed the grounder. Derek Kasperzyk scored, and the Bobcats had tied the game at nine apiece. This was the type of rally that the Bobcats couldn’t produce in two losses on Saturday. According to Delaney, it all came down to the team’s focus today. With Canisius jumping ahead of Quinnipiac in the MAAC standings after Saturday’s doubleheader, it was crucial for Quinnipiac to stay focused and end the series with a win, tying the standings back up. Quinnipiac will have a quick turnaround as the team heads out on a five-game road trip that starts this Tuesday at the University of Hartford, and ends with a three-game series at La Salle University. The Bobcats will return home on April 16th for a matchup with their crosstown rival, the Yale Bulldogs.